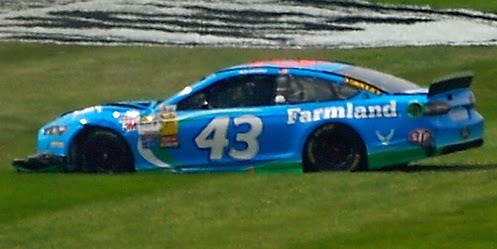 Personally, I think if Allmendinger didn't leave after the 2011 season this car would have won by now. AJ and Greg Erwin were clicking would have been a force in 2012. Instead Greg Erwin got fired because of Almirola's crappiness. Note: Thankfully, we did not have any start and parks in this race. Very encouraged to see LASTCAR regulars Josh Wise and Joe Nemechek finishing under power. That's a good point, but for A.J., if a Penske ride opens up, and you have a chance to get it, then you should probably go for it. It's unfortunate for Erwin, though - I do remember them being very competitive together, especially Dover and Watkins Glen. I'm very pleased to see that, too. PPR has had sponsorship for most of these first five races and is still without a single last-place finish, while Nemechek's alliance with Jay Robinson and Michael Waltrip is paying dividends for his 2014 effort. It just goes to show that "start-and-park" isn't a permanent label - it's just what these teams have to do to survive until they get their legs under them. Such a relief to see those two start to get some traction. Plus, with five different last-place finishers to start the season, that's another positive step. Brock: It doesn't change my stance on the start and park brigades, but it's encouraging to see these teams attempt to escape that branding.